There are no comments for Front Crook Reflection. Click here to post the first comment. 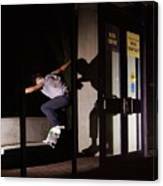 Front crook grind reflection on the side of a building, done by Matt Emelander.